Arena 4 Finance - ​arena4finance delivers the first course to held at the newly launched TUCO Academy Training Rooms in central Manchester. 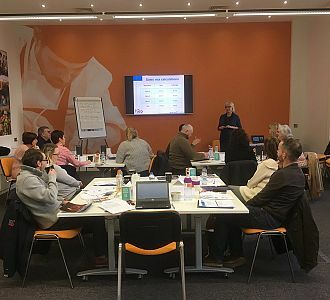 This week Debra Adams, Head of Professional Development at arena4finance, was honoured to host the first training event to be held in the newly launched training rooms at the TUCO Academy at their new HQ in 20 Dale Street in Manchester city centre. The course was Food and Beverage Cost Control focusing on how to manage gross profit with increasing food costs, control of payroll costs and menu engineering. The new Training Room at the recently opened HQ provides a wonderful location for learning in an inspiring atmosphere. We will be offering additional courses there throughout the Spring including Finance for Non-Financial Managers on the 15th March – follow this link for details. We are also very excited to be offering the first HOTS Business Challenge at the TUCO Competitions 2018 to be held this year at the University of Warwick.This brand-new competition has a team working together to run a simulated hotel business. HOTS stands for Hotel, Operations, Tactics and Strategy and is a web-based business management simulation that challenges participants to redevelop and manage a large hotel. Working in teams, entrants are required to take over the management of a 125-bedroom virtual hotel for a simulated two-year period with each team managing an identical hotel. Over the course of two days during the 2018 Competitions the teams will be working against each other to improve the overall performance of their hotel on a simulated month by month basis. For more information follow this link. TUCO is the leading professional membership body for ‘in-house’ caterers operating in the higher and further education sector. The association is committed to advancing the learning and development of catering and hospitality teams and work to provide quality standards, advice and information to those working in the sector.